Last month I attended a seminar day at Birmingham, ‘Teaching Difficult Subjects’ (organised by the Higher Education Academy in the UK). Although the full content of the day was fascinating (and wide ranging) encompassing genocide, holocaust and ‘war studies’, I mainly attended to hear Kate Skinner speak on teaching the slave trade “These Stats are Somebody’s Ancestors”. Dr Skinner’s presentation highlighted the lack of primary materials supported with advanced level teaching material, despite the wide range of academic publishing on the topic. Unusually, the Transatlantic Slave Trade Database (as discussed by Dr Skinner in her presentation) not only includes statistical information on the numbers of people transported across the Atlantic, but lists names and ships, offering students the opportunity to download data and analyse material for themselves. Teaching a comparative course last term at Manchester, focussed on the 19th and 20th centuries, these databases brought home to me just how many people continued to be enslaved and transported long after abolition legislation passed in Europe. Perhaps even more importantly, the site includes detailed ‘essay’ discussions of the trade, lesson plans and ‘vignette’ biographies to place these enormous numbers in individual context. But what resources exist beyond this specific focus on the slave trade for teachers of African history? 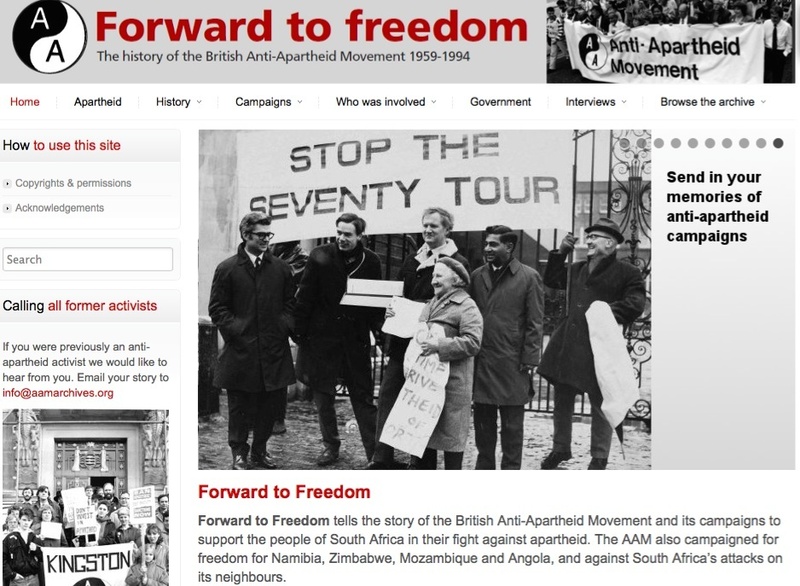 In contrast to the quantitative approach of the Transatlantic site, the newly launched ‘Forward to Freedom’ (The history of the UK anti-apartheid movement) site includes images of striking posters, badges (pins), and other ephemera from the UK anti-apartheid campaign, alongside video clips of interviews with former protestors, offering rich potential for students to consider the impact and involvement of international communities in the anti-apartheid movement, and for teachers to contextualise their teaching. Teaching a course which looks at gender and 20C African history this term, I have been keen to encourage students to use some of this newly available material. Setting a short source based assignment seemed like a good way to encourage students to think about using visual sources for African history. It could be argued that the incorporation of visual sources in our work on the African past should be having the same profound impact on what we write as the campaign to record and utilize oral sources a generation ago. But this expected revolution is not yet happening. Right now most of the image databases offer a somehow static presentation of pictures in sequence, deprived of their storage in the physical collection. Most of the projects tell not much about the contemporary use of the pictures. Open questions concern the flow of images across spaces, the re-use of pictures in other media (e.g. newspapers, books etc.) and the continuing (even unintended) effects. There is a growing literature on visual history and visual anthropology with some brilliant studies on individual photographs. However, right now, this did not have an impact on the design, interfaces, organization and contextual framing of image databases. Yet, through sites like those via Mission 21, it is possible to envision a future where students’ work on photographs like ‘Schoolgirls in Aburi at their garden-work’ (Mission collection – Basel mission) could be used to revolutionise the way in which these photographs are used and viewed. As Bronwen Everill highlighted in her post, there are a wide range of film clips and documentaries that can be used to enliven a wide range of historical topics, but require caution. As part of the same source exercise, I asked students to look at their choice from a small selection of the films available to watch at the Colonial Film Archive. Not all films indexed are digitised, but those that are have a major advantage over the (many) clips and documentaries available online, in that part of the project was to include detailed academic analysis of these films, in open access format. The site enables students to see one of the ways in which western popular culture constructed ‘Africa’ after the second world war. One film students looked at was ‘A Mamprusi Village’ (Ministry of Information, UK, 1944), which takes as a key theme the importance of a slow and steady ‘progress’ towards self-government. Through the background literature on the site, the film’s impression of monolithic colonial attitudes is contextualised: some reviewers criticising the film as racist and unsuitable for children at the time of its release. Watching and analysing the films in critical context, as some students noted, some scenes clearly undermine the colonial narrative. The HEA is organising another training event of interest to Africanists next month. Paul Jenkins (2002) Everyday life encapsulated? Two photographs concerning women and the Basel Mission in West Africa, c.1900, Journal of African Cultural Studies, 15:1, 45-60. This post is part of an ongoing series on “Teaching Africa’. If you are involved in a course or class and would like to contribute, please do contact us. Thanks for sharing! Do you know about the newer/still in development database that complements the stats of ASTD? Slave Biographies (http://slavebiographies.org/) focuses on identities, including names, ethnicities, and sometimes occupations and illnesses, doing a bit more to remind that these stats are someone’s ancestors. I didn’t – thank you Jill, I’ll have a look now.